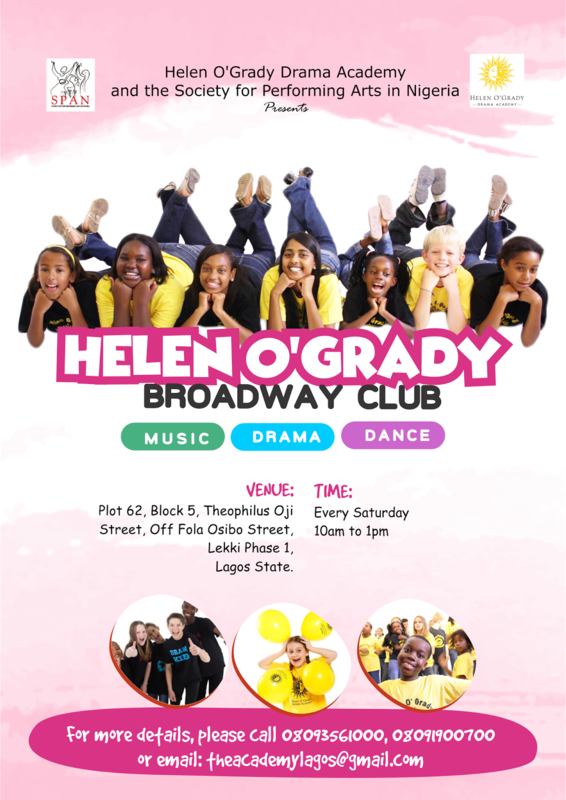 HELEN O' GRADY DRAMA ACADEMY, LAGOS ISLANDS - NIGERIA: Introducing The Broadway Club with HOG Drama Academy Lagos Island! Introducing The Broadway Club with HOG Drama Academy Lagos Island! On Saturdays from 10am - 1pm, we are teaching all rounded balanced performing arts education to your kids. We teach them different genres of dance, various music instruments, they get to learn drama using the Helen O Grady Drama which is designed to boost self confidence and expression and then round it up at the end of the term with a major production. This term ...it's "Peter Pan ". Second term will end on March 24th, 2018. Club fees per child is N55,000 per term. Discount available 2 kids and above. Venue is Val's - The Dance Studio. Plot 62, Block 5, The Red Gate, Theophilus Oji Street, off Fola Osibo Street, Lekki Phase 1. For enquiries, please call 08091900700, 08093561000. Love this! It looks amazing! Helen O'Grady is just vibrant throughout Africa.